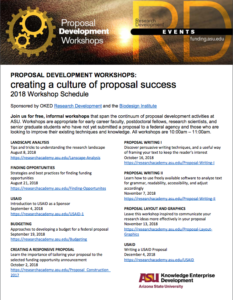 Check out the fall semester offering of proposal development workshops! The workshops are free and open to everyone. 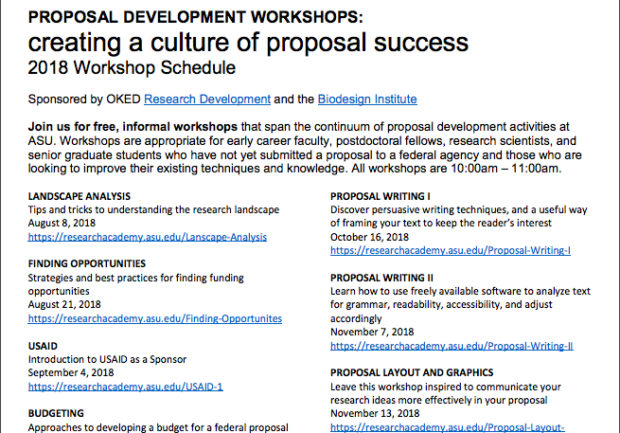 Workshops are most appropriate for those interested in changing sponsor agencies, those who have not yet submitted a proposal for a federal agency or are seeking to improve their techniques. Make sure to register in advance! Spots are filling up quickly. All in-person sessions are held 10–11 a.m. in the Biodesign Auditorium, located in the Biodesign Institute, Building A. Workshops will be streamed online.